Stop! before you eat that tomato…. 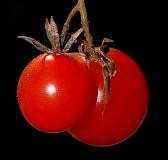 …read this book: “Tomatoland” by Barry Estabrook lifts the veil on the ugly truth behind the juicy tomatoes you may see around you. This is an industry based on the inhuman treatment of migrant workers or illegal immigrants. This situation is made possible by a system which demands that everything be available all the time so you can walk into your grocery store from a snowstorm and buy tomatoes and lettuce. This is not only unnecessary, it has also created a disconnect between people and the planet. Eating in season may be a new mantra but it is actually old wisdom. Our food system must be fair to the people who work in it and the planet that sustains us and we need to reëxamine what we demand from it. This entry was posted in Food Justice, Food Policy and tagged Food Justice, food policy. Bookmark the permalink.